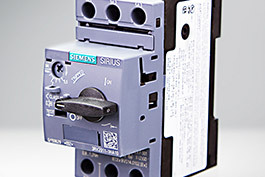 Switching, protecting, starting, and monitoring motors and equipment is easy for the SIRIUS Modular System from Siemens. Equally simple is the design for the construction and the installation into the control cabinet. Compared to the classic design, the SIRIUS Modular System is a genuine alternative. Through the modular design and simple wiring options, the SIRIUS Modular System components are of a size that are easily combined with each other. The perfect mechanical coordination also contributes to increased operational reliability and low maintenance. Since a high amount of wiring is eliminated and a simple installation is possible thanks to the available optional accessories, a rapid commissioning can be performed. The SIRIUS Modular System therefore represents a flexible and reliable solution to the conventional design and is used in many industrial applications. 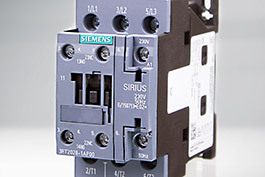 With Automation24 you will receive various SIRIUS Modular System components. In the category of Industrial controls, we offer Main contactors, Semiconductor relays, Contactor relays, Auxiliary switch blocks as well as Thermal overload relays and Electronic overload relays. On top of this, you can find Circuit breakers for motor protection and Circuit breakers for starter combinations with the accompanying Accessories for circuit breakers in the category Protection equipment. Moreover, there are Soft starters, Compact motor starters, Compact starters and matching Accesssories for motor starters / load feeders in Automation24's category Drive technology. All components are offered with proven screw connections for safe wiring. 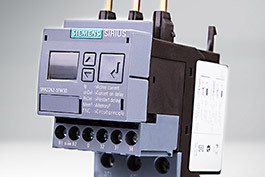 Compact starters such as the Siemens 3RA6120-1DB32 thereby represent a particularly efficient and space-saving solution because overcurrent monitoring and contactor are all contained in one unit. 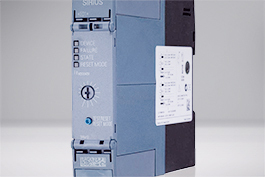 The SIRIUS Modular System from Siemens is the ideal solution when it comes to building control cabinets in a particularly simple, flexible and rapid manner. Therefore, do not lose any time and order the right components for your needs now at Automation24 at a low price.